1.Put a pan on flame,add oil and when hot add the cumin seeds and when they splatters add the chopped onions and fry till they turn transculate now add the chopped ginger,hinge,cumin powder,coriander powder,turmeric powder,chilli powder,amchur powder and mix well.Add 2-3 spns of water and fry so that the dry powders will not burn while frying.Fry till oil sperates. 2.Now add the diced potato and stir well so that the aloo is completely covered with spices,add salt and cover with with a lid and cook till potato to 90%.Stir in between. 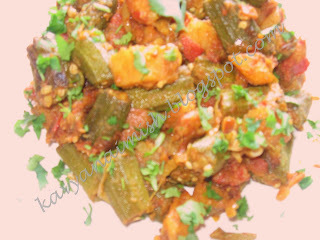 3.When the potatoes are done add the trimed Bhindi and stir well and cook it for 22-25 mins with out covering with a lid.Toss in a while,by then we can see that Bhindi are 60% done,now add the chopped tomato and cover it with a lid and cook it on medium for 8-9 mins and mix in a while but be carful when u do it,as bhindi may get seprated when we mix hard. 4.Finally add the chopped cilantro and switch off the flame and serve hot with chapathi/Paratha. I didnt find time making chapathis so I served it with Jeera Rice.But this also tasted gud.We enjoyed each bite of potato and Bhindi. Thanks Sailu for this wonderful recipe. 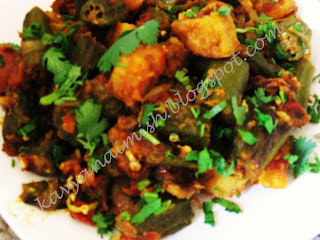 Sharing this recipe with Divya for the Bookmarked Recipe event in her blog Dil se. Thanks Divya atleast in this way I can try few reicpes which I wanted to try from many days and keep on postponing them. Thanks for sending this to the event Kavya! wow.. nice entry kavya.. looks great..
Wow Aloo and bhindi, I have only had this at restaurantsbut never tried this looks very delectable!!! Aloo and bhindi, sounds tempting. I never tried this before. Thanks for sharing. plz visit my blog when u get time.